An internal interface for our Smart SoftPLC and Smart Gateway products is now available, providing the lowest cost connectivity to Allen-Bradley Remote I/O (eg: 1771, 1747 (SLC-500), Flex, and other compatible networks). Upgrade existing A-B PLC systems without replacing or re-wiring the I/O - with SoftPLC you can even re-use most (and many times all) of the existing logic and program documentation! Contact us for pricing or more information! A packaging machine was still using a PLC-2/20 based system for its controls. The customer wanted to connect the machine to a new plant-wide Ethernet. 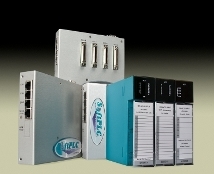 A number of options were considered, including adding communication modules and using a Gateway or HMI, or converting to a PLC-5 or ControlLogix. But the best option, and the one selected, was to convert the PLC-2/20 to a Smart SoftPLC, leaving the existing 2 racks of 1771 I/O in place. The process entailed uploading the existing logic using TOPDOC PLC-2 (the customer had no PLC-2 programming software) and converting it using SoftPLC's automated utility. All rungs converted 100%. 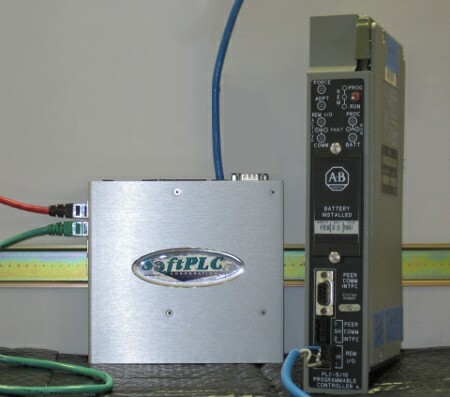 On the hardware side, the PLC-2/20 processor was replaced by a Smart SoftPLC with an A-B RIO interface. 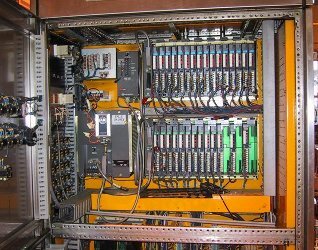 The 2 rack-based local I/O adapters (1771-AL) were replaced with remote I/O adapters (1771-ASB purchased at very low cost through the surplus market). Then, standard Belden "blue hose" cable was used to connect the SoftPLC to the I/O racks. The PLC-2 I/O included a Gray Code Encoder module (1771-DKC) which transitions too fast to work properly on A-B's slow RIO network. So a SoftPLC Tealware TTL module was used for this I/O, mounted directly on the Smart SoftPLC using its local Backplane3 interface.